Darjeeling;nestling in the grandeur and beauty of towering snow-capped mountains with the mighty Kanchenjunga (King of the Mountains) dominating the somber landscape around, lies a jewel of a town — elegant, sophisticated and incredibly beautiful; the name of Tibetan origin means where Indra’s thunderbolt or scepter rested (Dodi-thunder bolt, Ling-place). In Sanskrit, the name is derived from the world ‘Durjay Ling’ means ‘Shiva of invincible prowess, he who rules the Himalayas’. The official name of the town town today is known as Darjeeling. 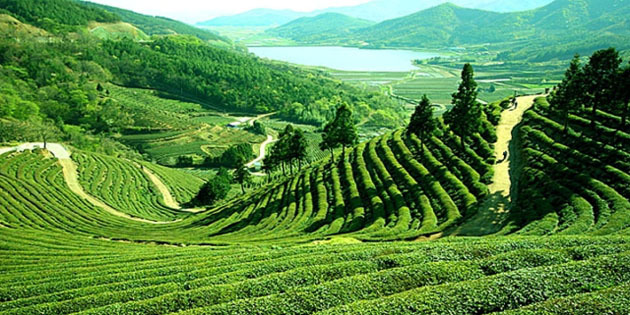 Sikkim; could be described as a fairy-tale land. It is an amazing place of hidden valleys, mystical monasteries, snow-fed lakes with a high mountain feel and covered with flowers and forests. Sikkim is now a state of India tucked in the Himalaya across Nepal’s eastern frontier. It is crammed in between Tibet (China) to the north, Bhutan to the east and the Indian state of West Bengal to the south. This former kingdom is home to three major population groups – Lepcha, Bhutia and Nepali – providing a rich and varied but particularly a colorful composite of cultures. Mt. Kanchenjunga, the third highest peak in the world at an altitude of 8,586m. dominates the landscape and is revered as Sikkim’s guardian deity. We commence this tour with a flight to Bhadrapur and continue our journey by car to Sikkim. We then continue our trip to excursion around Gangtok, Pemayantse and Darjeeling. Finally, we finish our trip with exploring tea garden, fantastic mountain views from Darjeeling.